I first had the idea to tell you about the new addition to the Costello family last week but never quite got round to it. This weekend though, the number of new members of the Costello clan multiplied. At first glance, you must be thinking, be proud. And indeed, we are. But all is not as it seems. So what are the new additions? They are fairly small, not smelly, not noisy but they are going to plague me for a full year. For the past 2 weekends, Millie has brought home TROPHIES!! Medals we have got used to – There’s quite a collection up in the girl’s rooms for various swimming triumphs. They sit there quite happily not causing worry or trauma to anyone. 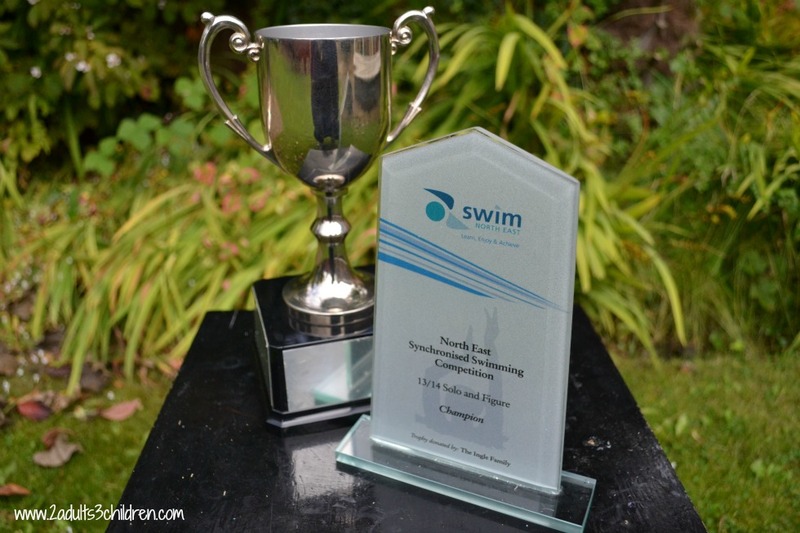 These trophies are a different matter though – THEY HAVE TO BE RETURNED IN A YEAR! Yes, a full year of worrying about them getting knocked, damaged, lost. We need to have them engraved with Millie’s name which is no problem – The worry will be every day this year thinking I must remember to give them back at the same competition next year. I think we all know what will happen next year – I can just imagine it now, half way to Sheffield and we have forgotten the blasted trophy! Do you have a selection of trophies? What do you do with them? PS I’m not as miserable as this post suggests – A massive well done to Millie for all her hard work. We are super proud parents! We have a floating shelf high up in the dining room for all Liam’s football and cricket trophies. It was from IKEA. They are very safe up there.